You may have read recently that healthy frozen embryos are being destroyed because patients are led to believe they are only viable for as little as five years. With more than 120,000 frozen embryos in storage in Australia, many IVF clinics ask patients to destroy them within five to 10 years. "Firstly, I am not even sure why there should be laws, or even guidelines, in place to cover this. What is the legal implication if the embryo is kept or not? Surely that decision should be up to the owners (the parents). Unless you have actually been through this it would be hard to understand the emotional dilemma that comes with making a decision about unused embyos. For many people, doing nothing is avoiding that dilemma. And I think they should be allowed to deal with the dilemma in that way if they wish to. I had a lot of angst dealing with what to do with our frozen embryos. I was 40 and had just found out I was pregnant with twins. And I had three healthy embryos waiting for me . I didn’t want to destroy them. I knew I didn’t want to donate them. I just didn’t know what I was going to do with them. So I froze them. Then I hit 43 so it was going to be now or never. The decision was made that I would try again . And in the end all three didn’t take. While I was disappointed that they hadn't worked, I was relieved that in the end I didn’t have to destroy them. They said their farewell in my body, and that gave me some comfort. What would I have done if I was given a "time limit"? Because of my age, I probably wouldn’t have been too bothered because I would not have tried to fall pregnant 10 years down the track after the birth of the boys.And maybe in the back of my mind it would have been a relief that someone had made the decision for me; that I could "blame' the legal requirement or the clinic for their destruction, rather than my own decision . But I know if I were younger, say 30, I would have opposed it. What if I did want another child 10 years down the track and couldn’t because my embryos had been destroyed. 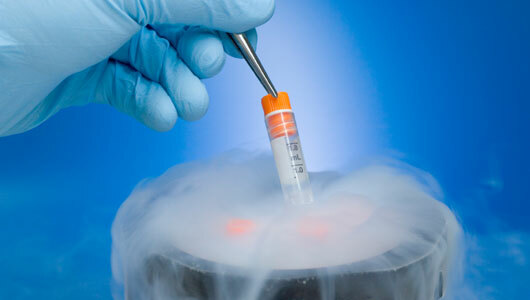 As long as people can afford to freeze their embryos, they should be able to do so for as long as they wish. Its their property, and unless science provides a good reason not too keep them indefinetly, then legal requirements should not come into the picture."